Software Studies Initiative: Exhibition opening: "The Aggregate Eye: 13 cities / 312,694 people / 2,353,017 photos"
Exhibition opening: "The Aggregate Eye: 13 cities / 312,694 people / 2,353,017 photos"
Nadav Hochman, Lev Manovich, Jay Chow. "33,292 photos shared on Instagram in Tel Aviv during April 22-26, 2012." Digital image rendered with custom software. Maps, photographs, and cinema are the principal technologies that individuals, small groups, and businesses traditionally have used to represent cities. Today, urban representations can be created by hundreds of millions of ordinary people who capture and share photos on social networks. If we were to aggregate these masses of photos, how would our cities look? How unique are the photos captured by each of us? Are there dominant themes regardless of location? The Aggregate Eye, a project created by Nadav Hochman, Lev Manovich, and Jay Chow, investigates these questions. 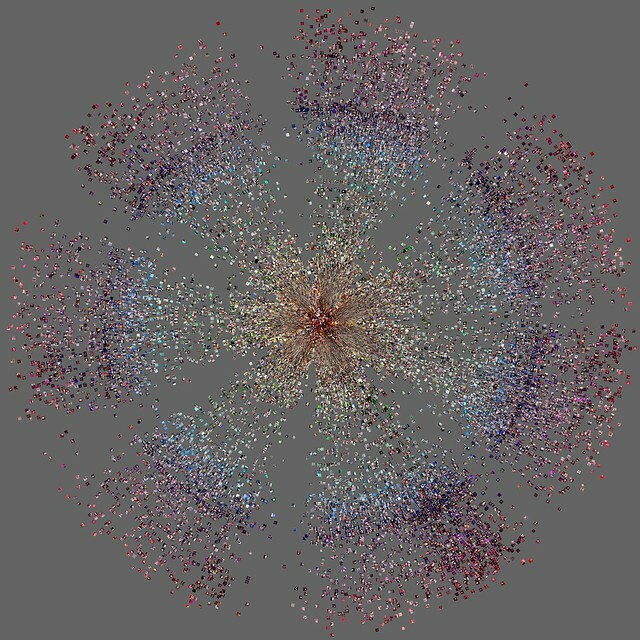 The collaborators downloaded and analyzed 2,353,017 Instagram photos shared by 312,694 people in thirteen cities over a three-month period. The large prints and video included in the exhibition combine these photos to reveal unique patterns. One set of images compares New York, Tokyo, and Bangkok using 150,000 Instagram photos. Another image, created by 53,498 photos taken in Tokyo over several days, depicts a gradual progression from day to night activities. A visualization of 23,581 photos shared in Brooklyn during Hurricane Sandy captures the dramatic narrative of that day. This exhibition is a part of the Phototrails project, initiated by Hochman, Manovich, and Chow to investigate patterns in social media user-generated photography and video. The Atlantic Cities, Der Spiegel, The Guardian, and Wired have reported on the project. Lev Manovich is world-renowned innovator in digital humanities and theorist of digital culture and media art. His global reputation in digital humanities stems from the tremendous impact of his 2001 book,The Language of New Media (The MIT Press, 2001), which has been translated into ten languages. His most recent book, Software Takes Command was published this summer (Bloomsbury Academic, 2013). He is Professor of Computer Science at The Graduate Center, City University of New York, and Director of the Software Studies Initiative. Manovich’s art projects have been presented at ICA, Centre Pompidou, The Walker Art Center, Chelsea Art Museum, San Diego Museum of Contemporary Art, Gwangju Design Biennale, and Graphic Design Museum (Breda, NL). Nadav Hochman is a doctoral student in the History of Art and Architecture at the University of Pittsburgh and a visiting scholar at the Software Studies Initiative at the Graduate Center, CUNY. His research focuses on the use of computational methods for analysis of massive online visual cultural data sets. He holds master’s degrees from the University of Pittsburgh and the Interdisciplinary Program of the Arts at Tel Aviv University. Hochman was a visiting researcher at the Museum of Modern Art and is an Andrew Mellon Research Fellow (2013-2014). Jay Chow is a recent graduate of the University of California San Diego with a BFA in Interdisciplinary Computing and the Arts. He is a researcher at the Software Studies Initiative at Calit2, where he develops tools for the analysis and visualization of large image and video collections for the humanities. Alise Tifentale, a doctoral student in Art History at the Graduate Center, City University of New York, is an art historian, editor, writer, and curator whose interests include the history of photography as art and new media aesthetics. In 1996, Tifentale co-founded E-Lab (now called RIXC), the first new media arts activist group in Riga, Latvia. She co-curated the Latvian Pavilion at the 55th Venice Biennial (2013), and is the author of The Photograph as Art in Latvia, 1960-1969 (Riga: Neputns, 2011). Hyewon Yi, Director of the Amelie A. Wallace Gallery, has been curating exhibitions at the Gallery regularly since 2006. Having served previously as an adjunct instructor, she joined the faculty of the Visual Arts Department at SUNY College at Old Westbury as a full-time lecturer in Fall 2013, where she teaches History of Photography, New Media Art, and Introduction to the Arts. Yi earned her PhD in Art History at the Graduate Center, City University of New York in May 2013. Gallery contact: Hyewon Yi, yih@oldwestbury.edu.